Saute chopped onions in large saucepan until brown. Add cumin powder, chilli powder and cook for another minute. Add cut pieces of sweet potato, pumpkin and then add the chicken stock. Bring to boil, reduce heat and simmer until the vegetables are soft.Turn heat off and blend into a puree using a bar mix. When pureed if you feel it needs more salt, pepper or chilli please feel free to add as you like. 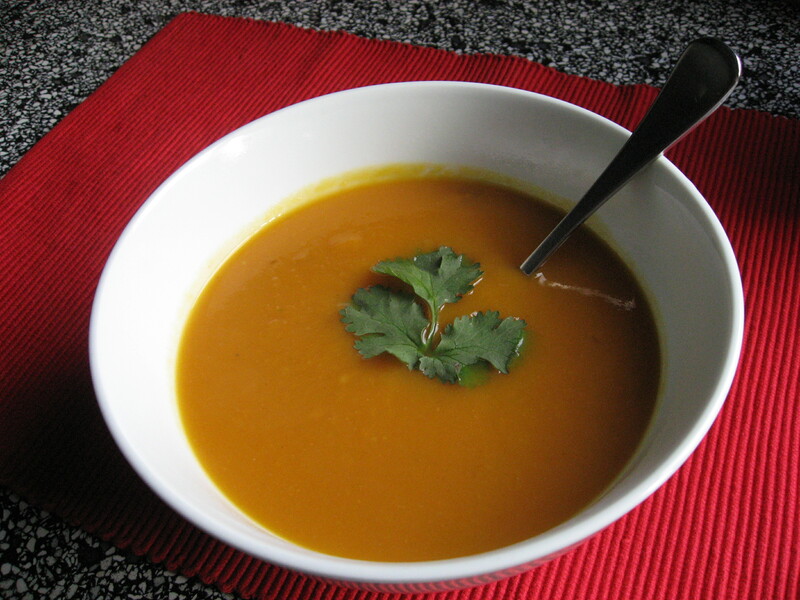 To serve soup place in large bowls and garnish with chopped or sprig of coriander. If you don’t have any home made chicken stock you can use the store bought stock. I have also used stock cubes with this recipe and it works just as well when you are pressed for time. To prepare stock using the cubes first saute your onions and spices then add your 2 liters of water then your stock cubes and bring to the boil. When the cubes have dissolved add your vegetables and simmer until they are soft. If you find the soup is very thick once you have pureed the vegetables add a little bit of chicken stock or if using cubes a another stock cube with more water to thin the soup out a little more. Ensure that it is of thick consistency and not too runny.